Twenty to thirty years ago, when you walked into a bathroom, there was most likely just one single ceiling fixture that illuminated the entire space. There may have been a vanity light above the mirror, but it was only turned on when someone was brushing their teeth, shaving, or putting on makeup. As bathrooms have become more important in home design (and more expansive in terms of space), there has also been an increase in the need for appropriate lighting. Small bathrooms may only need one light, but if there’s a double sink, a tub, a shower stall, and a toilet, it may be necessary to add more lighting or rethink where the fixtures are placed. At Passion Lighting in Grapevine, we can help you find the ideal bathroom light fixtures. When you’re getting ready in the morning in front of the mirror, whether you’re shaving or putting on makeup, it’s important to be able to see what you’re doing. If the only light is coming from above your head, there will most likely be lines and shadows on your face that can make certain tasks like shaving and applying foundation more difficult than they need to be. Rather than the bright “dressing room” style vanity bulbs above the mirror, consider placing a pair of sconces on either side of the mirror at approximately eye level. This will ensure that light is being cast across your face, not from above or below it, eliminating those unwanted lines and shadows. 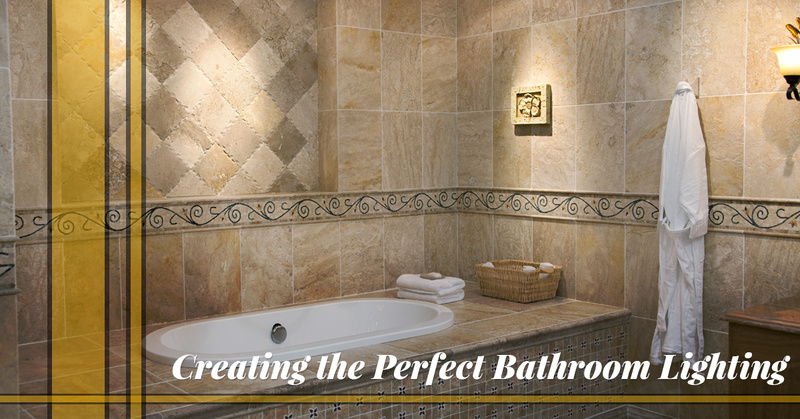 Bathrooms are no longer simply a space where you get in and get out in just a few minutes. You spend time in the tub after a long day, relaxing and soaking away your stress. This function is what makes ambient lighting and dimmer switches so important in a bathroom. The main ceiling fixture might provide enough light for the room, but lowering the levels can help set the proper mood for your after-work soak. Recessed fixtures above the tub area can also be placed on dimmer switches, giving you the ability to set the lights exactly where you want them. Dimmers also let you keep the lights low when you have to be up early in the morning, as well as help you wind down at the end of the day. No matter what lighting you choose for your bathroom, the space should be one you enjoy using on a daily basis (because you’re going to use it on a daily basis). If the lighting is too harsh or there’s not enough illumination for the entire room, you’re not going to like being in there very long, and the idea of relaxing will be the furthest from your mind. If you’re unsure which bathroom fixtures will be best for your home, or you have an idea for lighting design but are unsure how to execute it, visit our showroom in Grapevine today. We can show you a number of options and answer all of your design-related questions.